Universally recognized as one of the most potent acts in music today, HIGH ON FIRE creates modern heavy metal that merges primal fury and aggression, hesher bombast and hall of fame heaviness. The group features vocalist and cult guitar hero Matt Pike -- also a founding member of the famed underground band SLWWP -- along with powerhouse drummer Des Kensel and talented bassist Jeff Matz. HIGH ON FIRE's last studio album De Vermis Mysteriis was released in 2012. A brand new record is in working progress now and will be released later this year. 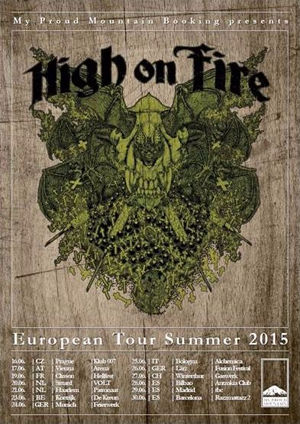 On their upcoming summer tour HIGH ON FIRE will be first presenting songs of this new record on European soil. “Des, Jeff and I are really getting creative and writing a hell of a new record," states Pike. "It's a crazy project and I can't really explain what it's all about just yet, but we've been writing a lot of crazy intense material that will up the ante, and bring things to another level." "Everyone is asking what the new HIGH ON FIRE music sounds like," adds Kensel. "Chew on some mescaline and listen to side B of (BLACK) SABBATH's Master Of Reality backwards at 78 RPM and it might give you an idea."